429 Gallowgate, Glasgow. G40 2DY. Tel: 01415546029. This was originally called Mac's Bar. 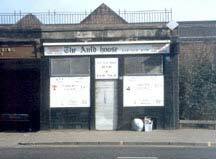 When the original Auld Hoose was demolished on the Gallowgate this old pub changed it’s name to The Auld Hoose, when the original Wee Mans closed down further along the Gallowgate it changed it’s name again to the Wee Mans. In 1889 this pub was sold for a massive £525. The Weemans 2005. see the original WeeMans at number 361 Gallowgate. 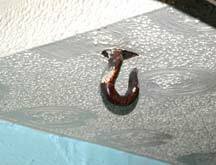 This hook was for transporting the large barrels to and from the cellar. The owner has made this a feature in the bar. Do you know anything about this pub or any other pub in Glasgow? This was the first pub in Glasgow to sell draught beer. Licence Holders over the years. 1950-1920 Thomas McNulty, this is were the pub got its name Mac's Bar. Mr McNulty stayed at 187 Comelypark Street. 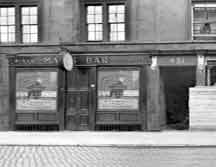 1902-1890 Michael Dunbar, Mr Dunbar paid an annul rent of £ 60.00, he also had a pubs at 32 Main Street, Bridgeton, 72 Gallowgate. 1870-1861 James Dickson, Bottle & spirit Merchant.